Windows Boot Genius can Burn bootable ISO Image into a disk with built-in CD/DVD/USB burning software to help you boot your PC and repair all booting issues. Fix all startup issues, including computer that keeps rebooting or won’t boot at all, Blue Screen of Death, Black Screen of Death, freezes, and crashes. Recover missing boot sector to fix “NTLDR is Missing”, “BOOTMGR is Missing” errors etc. Repair crashed MBR, corrupt registry, virus-infected registry key value and partition table. Support Windows 10/8.1/8/7/Vista/XP and all computer brands: Dell, Acer, Asus, Sony, HP, Toshiba, Lenovo, etc. You can backup your hard drive in case of data loss or Windows crashes and other boot issues. Backup Windows system, applications, and files before you start to troubleshoot Windows or a hard drive actually crashes. Restore Windows after computer crash without reinstalling Windows OS. Clone a partition or hard drive when you need to copy old drive to a new one. Windows Boot Genius enables you to rescue data without data overwrite even your Windows failed to boot up. Recover your family photos, video and music collections, and other files. Recover files lost from formatted or crashed hard drive. Repair corrupt, altered, or lost partition table. Rescue data from crashed Windows system. Recover lost Windows local administrator/user passwords in Windows 10, 8.1, 8, 7, Vista, XP. Recover domain administrator and user password in Windows Server 2012/2008(R2), etc. Find Windows product key before reinstalling. Find Office product key, SQL server Key for reinstall to avoid a second purchase. Simply deleting the file off your hard drive doesn’t actually delete it. Windows Boot Genius offers you a chance to permanently delete any data on your computer. Wipe a specific partition before you clean install Windows or any software. Remove sensitive folder from your PC without any possibility to recover. Delete virus-affected files when your computer is infected with boot sector virus. Wipe any data before you donated or sell your computer. All data wiped have no chance to be recovered by any data recovery software. Not a good feeling when it would not even burn to brand new 8GB USB Flashrive nor a 4.7 Sony gold DVD. Running Win 7 Home. Downloaded, installed on my (GENUINE) WIN7/64pro. Started the program. Chose for CD/DVD rescue. Accidentally pushed “POWER OFF” button instead of “OPEN CD DRAWER”. Computer nicely stopped all running programs and shut down. Rebooted automatically, got message “not correctly closed…”. Chose “SAFE” mode : computer restarted after few seconds. Same when I chose any other boot option. Computer kept resetting after few seconds. Unless this free version is an older version and cannot support Windows 10. This will be a big shame. I just checked this free version and it is 3.1.0.0. dated March 2017. I downloaded the current version from Tenorshare and it is identically this same old version as well. This is NOT Ashraf’s fault but Tenorshare’s fault as they are very lazy and NOT updating this program. A very big shame on Tenorshare. Long on promise, short on delivery. I’ve tried this on various boot-failure problems (older hardware, Win 7 — which is supposedly more in this program’s wheelhouse) but with no conspicuous success to date. I’m afraid your House reviewers with their standard high praise continue to have a low level of credibility. Nevertheless, I’ve kept this program in the toolbox, due to the promise of the idea, in the faint hope it might one day surprise me. But, you know, in most cases I think I’d rather take my chances — in a full manual approach — with a Hiren’s or a Strelec Win-PE disc, and whatever I’ve managed to learn over the years. I believe this is not a fully tested software. I tried to correct a Vista system Registry and it messaged me that this function is not availabe for Vista and above. Another bug I found: I have a dual boot system. Sometimes it detects both OS, sometimes don’t. I’ve bought it years ago. My iso file is from 2014. The version offered here in 2018 is exactly the same, it has not been updated since. I could not use it with a motherboard from 2013 (Asus M5A97) because the USB mouse was not detected, and I could not navigate through the menu with the keyboard only, so it was totally useless. The support said they were sorry, and that’s all. As it is free on SoS, it is worth downloading anyway. It works well on my Win 7 computer but I keep getting a blue screen shut down window on my Win 10 laptop. IT works, but can’t really use the Data Recovery feature. Where should we backup the recovered data when plugging in an USB drive, Windows Boot Genius doesn’t recognize the USB drive. Already tried different ports and different USB drives as well. Windows Boot Genius is the ultimate tool aimed at fixing issues with windows booting. This includes issues like computer crashes, blue screen, random restarts, can’t boot, and other Windows booting problems. Many users face these type of problems with their PC, but are unable to fix it. These problems occur easily but its difficult to figure out what might be causing them. A basic and regular user just have to give up because they do not understand what the issue is, what is causing the issue, and how can it be fixed. Windows Boot Genius comes with over 40 integrated tools that can boot your computer from CD/USB, fix all PC booting problems, as well as repair corrupt Windows system, recover data, re-partition and clone hard disk, and do much more. The installation process is straightforward and generic, however, downloading the installation file takes some time because of its size (~250MB). The main user interface is simple and well-arranged. The sidebar on the left side of the main window with two menus: How to create bootable CD/DVD or USB drive and How to boot Windows from CD/DVD or USB drive. Selecting the first menu enables the user to burn necessary files onto CD/DVD/USB to boot from later. The second menu contains instructions on how to boot from the CD/DVD/USB that you have burnt the necessary files on. Although it contains many tools, the step by step process makes it easy to use for all kinds of users even novices. Fix all start-up issues– including computer that keeps rebooting or won’t boot at all, Blue Screen of Death, Black Screen of Death, freezes, and crashes. Recover missing boot sector– to fix “NTLDR is Missing”, “BOOTMGR is Missing” errors etc. Repair– crashed MBR, corrupt registry, virus-infected registry key value and partition table. Wide range of Support– Support Windows 10/8.1/8/7/Vista/XP and all computer brands: Dell, Acer, Asus, Sony, HP, Toshiba, Lenovo, etc. Easy to use UI– the user interface is polished and modern yet easy to use. This makes it easy to use for any kind of users. Recovery Options– recovering formatted data and restoring Windows after crashing, to recovering lost passwords. Crashes sometimes– on some system crashes occur when you try to boot from the CD/DVD/USB that you have burned. Windows Boot Genius gives you the right and powerful tools to help fix any kind of issues that you may encounter with Windows boot-up. It makes the process of creating bootable media easy by breaking it down to steps. This enables all types of users to fix their Windows Boot-up issues themselves without spending a lot of money or losing important data. Windows Boot Genius is a program that you can actually rely on when you need to solve boot errors, freezes, and many other system-related problems. It is definitely one weapon to keep with you when you’re looking to combat Windows start-up related issues and crashes. Well, since the .iso bootable file supplied in this free giveaway is version 3.0.0.1-1887, dated 2014-7-31, I’m not surprised that there may be Win10 compatibility issues or non-functionality. You may need to get the latest version (3.1.0.0) for capable Win10 support. Installed fine – no problem, but when I tested the USB boot drive, it crashed my machine. It started loading Windows and then I got a blue screen (BSOD). No thanks. I am taking it off my machine! I just got an email from Tenorshare tech support and they said they are “unsure” whether Boot Genius runs on Windows 10, so I don’t have much confidence in their software. This wasn’t even the question I asked them so they need help in their translation department. I don’t believe it. I have been looking for this software to fix my desktop from crashing at startup. All I needed was a way to do a start up fix. You saved me a $100 dollar repair bill at the shop. that I grabbed from great offers like this one. Plus it does what it says it’s supposed to. I tried it on my non booting W10 Pro desktop. Oh Nooooo – Rob, you slipped into Win 10? Your windows crashing or giving you’re the blue screen is one of the worst things that could happen to you especially if you are working on a project. Although the problem might be easily fixed, other issues prove too complicated for users and they end up formatting their PCs. Since I had once gone through such an experience, I have always been looking for an effective solution in case I get into trouble again. I came across Windows Boot Genius and rightfully so, thought it will a good software package based on its name. However, I had to take it through the paces to find out what it had to offer. Here is my take. To start with, Windows Boot Genius supports Windows versions right from XP to Windows 10. As an admin, you will also get this software package to work in Windows Servers. In my case, I was using it in my Windows 10 PC. For a smooth downloading experience, you would want to have a strong and stable internet connection to get the installation file. After running the application, I found the UI to be clean and intuitive. As such, I had a smooth time hitting the ground running. I found it easy to use Windows Boot Genius especially when creating a bootable DVD with an ISO image. The prompts are easy to follow along without making you feel you are in the dark. Further, the bootable really works since I tried and even used it to fix my BOOTMGR. The clean and intuitive interface also adds to the ease of use. Just but to mention a few, Windows Boot Genius has a bunch of recovery options that will come in handy in different scenarios. The options range from recovering formatted data and restoring Windows after crashing, to recovering lost passwords. In my case, the option that I tried and worked was the admin/user password recovery option. In case you are planning to give out your computer, you should not worry about the other user running a data recovery software and recovering your sensitive files. What you only need to do is wipe out the data with Windows Boot Genius and you will be good to go. When it comes to issues dealing with Windows boot problems, a considerable number of users do not know how to go about them. Unfortunately, this package does include free tech support. If you for some reason you are unable to find your around while the software, you will end up with an additional problem on your table. My C Drive was quickly filling up and I decided to resize my partitions. This process messed my BOOTMGR and I was not able to properly boot my PC. Since I had created a bootable ISO using Windows Boot Genius, I was able to fix the issue. However, all did not turn out well since I wasn’t able to access the grub area because I have a dual boot of Windows and a Linux-based OS. 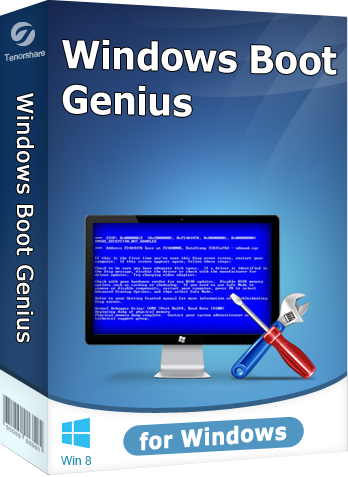 If you are facing Windows boot problems, then Windows Boot Genius can come in handy. The software’s clean interface and prompts will make it easy for you to create bootable media even if it is your first time doing so. With that, you will have access to a wide array of boot problem fixing tools. Hopefully you have Grub Bootloader (Super Grub II) on cd. I always have it handy when and if I can’t boot for whatever reason. It has saved me many times in the past. A month ago I had to send my notebook back to the factory as it wouldn’t boot into Windows. Though under warranty, it still cost me $20 for freight, insurance, etc. If I had had this program back then I could’ve saved myself the $20 and two weeks of lost time. While I hope I don’t need to use this program / device, it gives me one more tool to try and recover a crashed PC. Thank you Tenorshare and SoS for ‘having my back’! Sorry to disturb you Master, but as i missed the giveaway ,could you send me a copy of the Windows Boot Genius and the key if it was a public key? It’s time to learn how to do a clean reinstallation of the system. And so as to make a system restore point and a backup system using the free program AOMEI Backupper Standard. In the presence of basic knowledge, system restore will take from 15 to 50 minutes depending on method. Is a good program, I used when be back at school a year ago. Is really usefull. Sorry to disturb you Jesus! I missed the givaway ,so could you send me a copy of Windows Boot Genius and the key if it was public. Windows Boot Genius has made me feel cheerful, and a bit better organised. I’ve installed it on two PCs, one running Windows 10 and the other Windows XP (thanks very much Tenorshare for the 3-computer licence). On both machines it installed very quickly – with zero registration fuss – and opened a simple, clean, well designed interface. It immediately detected a RW CD/DVD disk and a USB flash drive as potential targets for creating boot devices, and created a bootable flash drive for me in seconds. Best of all, it gives clear, illustrated instructions on how to use the CDs and flash drives it can create, within the main application window. Sorry folks, I haven’t had a chance to test my new bootable flash drive yet since I’m too busy to reboot, but so far everything I’ve seen deserves a big thumbs up. What a great giveaway. Many thanks to Tenorshare and Shareware on Sale. Sorry to disturb you xoco,but as i missed the giveaway would you be so kind to sent me acopy of Windows Boot Genius and the key if it was a public key?